Add some color to your summer with the PLDM by Palladium Sheldon sandals. 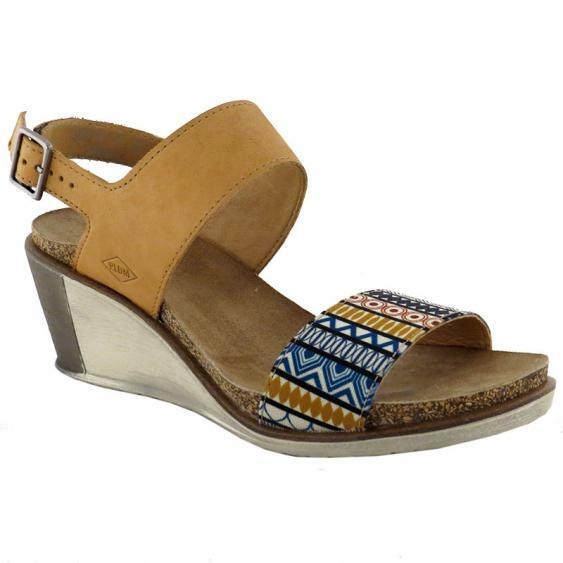 This women's wedge sandal features a leather ankle strap and printed textile toe strap for chic style. The cushioned midsole is comfortable as soon as you step in, and the cork midsole keeps you supported while molding to the shape of your foot over time. The leather wrapped wedge heel gives you an extra boost in height, while the platform design reduces the pitch for less stress on your feet. Soak in the sun with the stylish and comfortable PLDM Sheldon wedges. Heel height: 2 3/4", Platform height: 1"
This is a very attractive and versatile shoe. I have only worn them once. They were fairly comfortable, but the fabric strap dug into my feet a little. Hopefully, that will subside with a little wear or the application of some blister block wax. I love that it goes with so much. The mixture of colors, materials and the print work well together without the shoe being too flashy or too plain!